Laser wood engraving on the cheap works surprisingly well. I make a lot of boxes & cabinets and have long wanted to put pictures and words on items. The latest thing in the tool catalogs are ‘affordable’ laser engravers / cutters that start at several thousand and go up rapidly from there. Obviously that’s out of reach for a dabbler. Searching the internet shows lots of units for between $100 and $200 – all from no-name Chinese cos. Gearbest listed several models from 200mw to 5w. I settled on the 1600mw unit as the best compromise between power and budget at just under $150. When I ordered the unit I paid the extra ‘safe delivery’ extortion. It arrived perfectly intact. The fun began when I found there was NO instructions except for the pictures and one lone assembly drawing on their web page. Surprisingly enough this (and the pictures) were enough to correctly assemble the unit. The controller was fully soldered and only needed button tops inserted and general mounting. All the materials were correct and assembled easily. No software comes with the hardware, but the web page has what you need. The Benbox control software has step by step installation pictures that point at the buttons to push and in what order. This is a great help as the program defaults to Mandarin. Basically you generate whatever you want lased as an almost-any-format image file, bmp, jpg, png, etc. That is loaded and positioned (and/or scaled) on the screen and with one click the image is lased. The laser is not a toy, there is a real eye danger and the supplied goggles MUST be used. The software was a little confusing at first but after a couple days of lasing I quickly got the hang of it. Over all I give it four stars instead of 5 for the lack of docs. Thanks for the review of this. I have been interested in trying this out and at this price, sounds like a great option. Would you mind posting who you ordered from and the capabilities (size, materials it can engrave) of the laser. I think I will order the same setup. -- I've almost got all the tools I need, almost. Click the ’gearbest’ link in the original post and it will take you to the sales page. Where did you choose the safe delivery option and how much extra was it? It was $5 ‘shipping insurance’ & was on the shipping page of the order form. Save a link to the page so you can check the status. The vendor doesn’t have a tracking page but everything came on time exactly as described. As an aside, the only tools needed (metric allen wrenches) are supplied in the parts kit. Interesting. How deep can it burn? Also, how small a type size will it go to and still be reasonably legible? TIA. I bought one minus laser to use with a wood burner for $82 plus $30 shipping. Four days to Cincinnati, and then 6 days with USPS to southeast Michigan. Double boxed and well packaged. Definitely no documentation came with it and support from the vendor when you get to it, is in Chinese. It went together quite well in two hours with no rush, only had to make minor disassembly twice because I didn’t know the sequence. Lots of other things going on in life and haven’t gotten back to conquer the software yet. Actually I plan to use Arduino GRBL (g-code) instead of the available software. 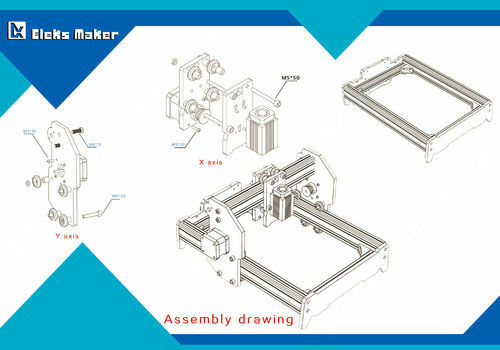 The parts are a steal at $82, 3 steppers, 8020 frame, precut thicker acrylic, gears / belts, Arduino, controller board, cables… Taking time to design it and then trying to buy individually and shipping would be a lot more. My only regret right now is that this is A5 size 5.8” x 8.3” and the A3 size 11.7” x 16.5” was only $60 more with a 500mw laser (no delete option), which I didn’t see at the time. I bought at GearBest, but the exact same one is available on a number of Chinese sites. The A3 size is on ebay US (California) for $300 plus $46 shipping. I have been wanting something like this for me and the disabled vets like me I teach. Does it or can it be adapted to doing turning items along with flat items? Also if I do not use their software what can I buy that will not only work with it but easy to understand since I have brain damage from a bombing in the middle east. The burn spot is about 1mm. The software is dead easy. Click the text button, type it in, move/size it (optional) and click lase. At slow speed (20 – no unit listed) you can burn down about 1/16” into pine (YMMV). At a certain point if you slow too much the material will catch fire and smear whatever you’re trying to cut. This is sold as an engraver and it engraves well, cutting, not so much. You can lase readable text that is about 1/8” high. Tip: start with large text and shrink down to lase. Thanks! That might work for burning my driver’s license # in the handles of my carving tools. I have a lot invested. 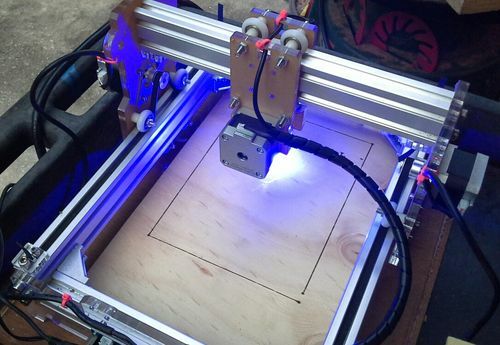 A laser engraver is something I’d like to have. I’ve heard they really stink (literally) when engraving and that it’s better to use them outside or near a window fan. Nice little machine MadMark! Please keep us up on projects you do with it! 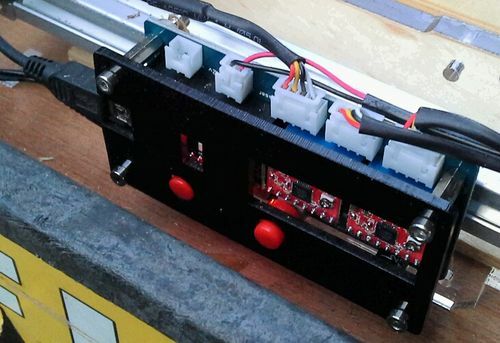 Rick M. have you seen the Laser/3D Printer/CNC/and more unit from Stepcraft? Small and low cost enough not to hurt to bad and it is made in Germany. The burn quality matches that of regular branding irons. 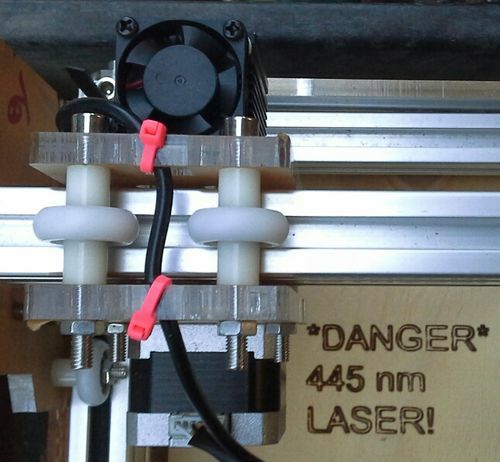 The laser and software are in mm, if you draw in mm in CAD you’ll get a 1:1 laser burn. There is a tiny amount of smoke from it that usually rapidly dissipates. I have a shop fan that always spins. The breakpoint where you need smoke handling are when you jump up to the 40+W CO2 IR gas lasers. For the LED based units in the 1/2W to 5W range not so much. 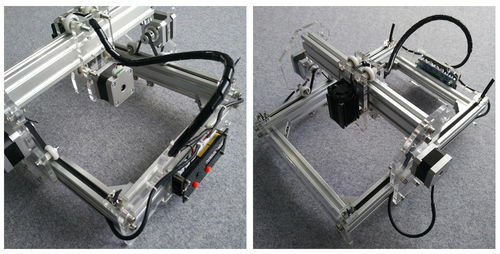 have you seen the Laser/3D Printer/CNC/and more unit from Stepcraft? oldnovice – I couldn’t find any mention of laser option? Did I miss anything? Interesting. I had been looking at having a local trophy shop do some engraving for me, but now am wondering if this would do the job. What’s the total size of the assembled unit?